Director – James Wan, Screenplay – Will Beall & David Leslie Johnson-McGoldrick, Story – Will Beall, Geoff Johns & James Wan, Based on the Comic-Book Created by Paul Norris & Mort Weisinger, Producers – Rob Cowan & Peter Safran, Photography (3D) – Don Burgess, Music – Rupert Gregson-Williams, Visual Effects Supervisor – Kelvin McIlwain, Visual Effects – Base FX, Cantina Creative, Digital Domain (Supervisor – Jay Barton), Industrial Light and Magic (Supervisors – Tim Alexander, Alex Prichard, Philippe Rebours & Jeff White), Luma Pictures, Method Studios (Supervisors – David Nelson, Josh Simmonds & Craig Wentworth), MPC (Supervisor – Darren Poe), Prime Focus VFX Ltd, Proof Inc, Rodeo, Scanline VFX (Supervisors – Julius Lechner & Bryan Hirota) & Weta Digital, Special Effects Supervisor – Brian Cox, Makeup Effects – Fractured FX, Production Design – Bill Brzeski. Production Company – Warner Brothers. In 1985, Tom Curry, a lighthouse keeper in Amnesty Bay, Maine, finds an unconscious woman on the rocks and grants her shelter. This turns out to be Atlanna, the queen of Atlantis. The two settle down together and have a child Arthur before soldiers from Atlantis come to force her to return. Arthur grows up into adulthood where he finds he has an ability to swim at great speed, breathe underwater and communicate with marine life. He begins to operate as what is nicknamed Aquaman. He intervenes to stop the hijack of a Russian submarine by pirates. During the course of this, he allows the lead pirate to go down with the submarine. The man’s son Manta swears revenge. 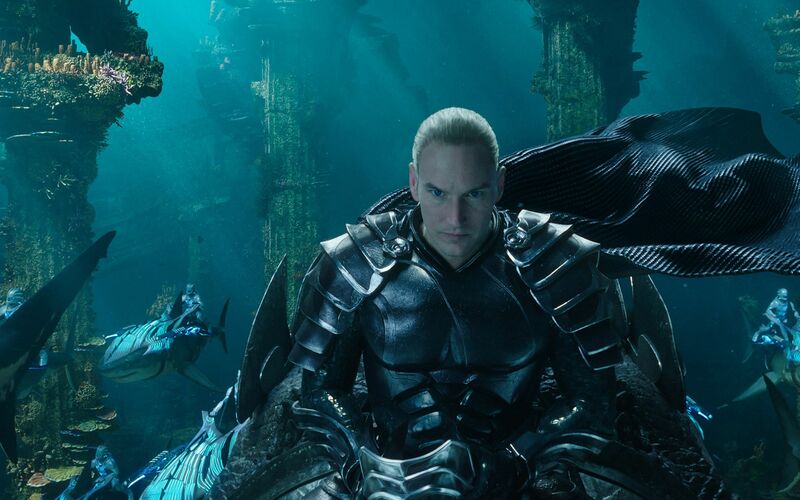 Orm, Arthur’s half-brother and the king of Atlantis following Atlanna’s disappearance, tries to unite the undersea kingdoms to declare war on the surface. Mera, the daughter of one of Orm’s allies, approaches Arthur, urging him to come and claim his birthright as the rightful king of Atlantis but he has no interest. Orm stages an attack, dumping the pollution of the oceans on the beaches around the world. After this, Arthur allows Mera to take him down to Atlantis, a hi-tech city on the ocean floor where the original surface dwellers have adapted to living underwater. Captured by Orm, Arthur challenges him in the arena. He is snatched away from defeat by Mera and the two set out on a quest to find the trident that will allow Arthur to claim the throne. 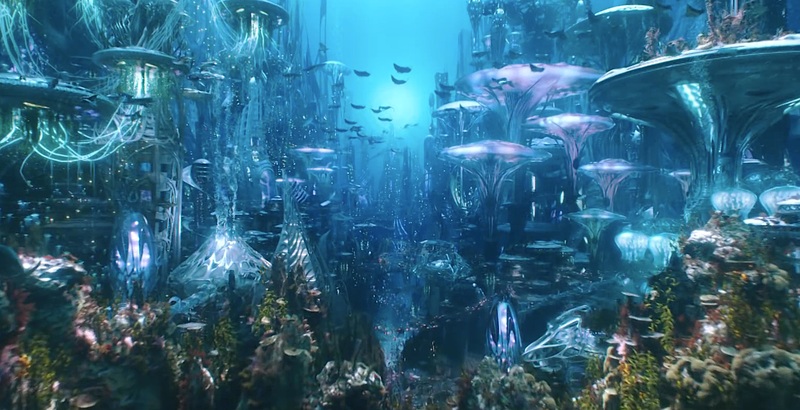 However, Orm has outfitted Manta with Atlantean technologies and he and his mercenaries come in pursuit. Aquaman is a superhero from the DC Comics canon. Aquaman first appeared in More Fun Comics in 1941 and then moved over to appear in Action Comics in 1946 but did not gain his own comic-book in 1962. It was not however until 1959 that Aquaman was given an origin as the son of human Tom Curry and the Atlantean queen Atlanna. (Aquaman’s origin story has been rebooted and changed over the years but the film stays with the original one given). Over the years, he gained various associates including a wife Mera, sidekicks Aqualad, Aquagirl and the porpoise Torpo, as well as boyhood adventures as Aquaboy. Aquaman was also one of the core members of the Justice League in their first appearance in 1960. For rightly or wrongly, Aquaman has been regarded as a joke on screen – as witness several episodes of Entourage (2004-11), which made an ongoing gag out of a James Cameron-directed film version starring Adrian Grenier. Mostly the joke seems to centre around how the specificity of Aquaman’s powers – as related to water – that make him weak for anything outside of that environment. There is even a trope at TV Tropes devoted to this This Looks Like a Job for Aquaman. Aquaman first appeared on screen in the animated tv series The Superman/Aquaman Hour of Adventure (1967-9) followed by episodes of Super Friends (1973-9). Aquaman also appeared in the Bruce Timm animated series Justice League/Justice League Unlimited (2001-6), although unlike the comic-book Justice League of America, he was not one of the founding members and only turned in occasional episodes. Aquaman has appeared sporadically in the various DC Universe Original Animated Movies, most notedly Justice League: Throne of Atlantis (2015), which was an Aquaman film in all but name and has a plot that prefigures a substantial portion of the one here about Orm stirring a war with the surface and Arthur having to reclaim the throne. In live-action, Alan Ritchson played Aquaman in five episodes of Smallville (2001-10) and there was also Aquaman (2006), an unsold pilot for a projected tv series starring Justin Hartley. Aquaman – or Ahh-kwa-man as everyone seems to refer to him in the film as opposed to the way I have always pronounced it as Ack-wa-man –first came to the big screen as played by Jason Momoa in a blink-and-you-miss-it appearance in Batman V Superman: Dawn of Justice (2016) and then made a full appearance in Justice League (2017). Although that was a radically different version of Aquaman than we were used to – rather than the blonde-haired (and sometimes bearded) and white skinned Arthur Curry that we have always had had ever since Aquaman was created in 1961, we were given Hawaiian native Jason Momoa as a black haired and olive-skinned Aquaman. (In fact, Patrick Wilson as Aquaman’s blonde-haired brother has far more of a resemblance to the comic-book Aquaman than Jason Momoa does). The Momoa Aquaman seems to have become the standard – he even turns up in toy form in The Lego Movie 2 (2019) (although that does also give us a brief appearance of the blonde Aquaman in contrast). While most of the costuming department for Momoa’s previous appearances have favoured battle armour (and deliver some stunning costumes for the film), it is nice to see when Momoa finally claims his crown that he emerges in an armoured version of the emerald green and gold outfit he has always been associated with. The Aquaman film was announced as part of the slate of DCEU (DC Extended Universe) films that emerged out of Zack Snyder’s Man of Steel (2013), Batman V Superman and Justice League, which were intended to launch a cinematic franchise based on DC Comics’ superhero pantheon to rival the success that Marvel are having with their MCU. The line-up has so far given us Suicide Squad (2016), Wonder Woman (2017) and the subsequent Shazam! (2019). Although the question of the future of some of these entries like the proposed standalone movies based on The Flash and Cyborg seems unclear at present. Meanwhile, DC seems to have given go-aheads to almost anybody who has pitched them a project – there is an extraordinary number of announced titles floating around in various stages of production, seemingly with no concern of tying them together into a connecting continuity a la the MCU. Indeed, with Aquaman earning over a billion dollars at the worldwide box-office, a spinoff The Trench has been announced – even though the creatures were created for the screen and do not feature in DC Comics. Zack Snyder is present as an executive producer but the directorial reins have been handed over to James Wan. Wan emerged with the hit of Saw (2004), which led to a long line of nasty sequels. Wan subsequently gained a strong foothold in the horror genre and went on to make the ventriloquist’s dummy film Dead Silence (2007), the vigilante film Death Sentence (2007), the haunting/astral projection film Insidious (2010), the true-life haunting/possession film The Conjuring (2013), Insidious Chapter 2 (2013) and The Conjuring 2 (2016). Wan has also produced all of theSaw sequels, Annabelle (2014), Demonic (2015), Insidious Chapter 3 (2015), Lights Out (2016), Annabelle: Creation (2017), Insidious: The Last Key (2018), The Nun (2018), The Curse of La Llorona (2019) and the tv series Swamp Thing (2019- ). Wan silences any doubts we might have about an Aquaman movie within the first few scenes where Nicole Kidman (in an outfit that boosts her by at least two bra cup sizes) turns into Acton Mom mode and kicks a horde of laser-armed soldiers through the walls of Temuera Morrison’s house. 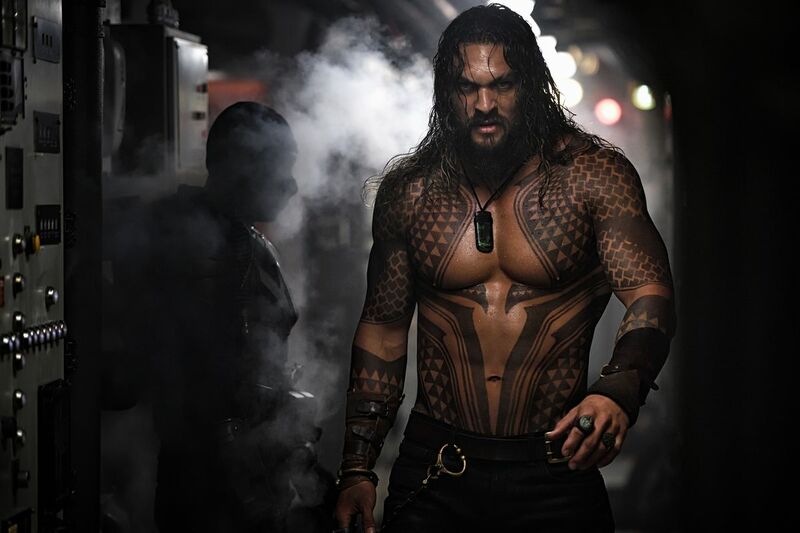 This is followed by the scene where Jason Momoa bursts into the hijacked Russian submarine, striding through steam towards the camera in slow-motion with his incredibly buffed body bared to the waist and heavily tattooed, long hair dangling across his eyes and going into action, using a torn-off hatch cover as a shield against gunfire, downing attackers by the dozens, taking knives and even a shell to the chest without any effect. It’s a kickass sequence designed forever to dispel any joke about how wimpy Aquaman is. We are awed even further a few minutes later as Patrick Wilson and Dolph Lundgren hold a war council in an impressive set of underwater ruins amid armies lined up on battle seahorses and sharks into the midst of which a submarine attacks, blowing up the ruins before Wilson heads into action on his seahorse dragging his trident down the length of the sub and then shattering its propeller. I consider James Wan one of the handful of top genre directors currently at work at the moment. Within the horror genre where he has almost exclusively specialised, Wan impresses again and again with his instinct for eerie effect. Here he creates action and big-screen CGI effects sequences in spectacular ways that make your jaw drop. The scale of scenes where Jason Momoa and Temuera Morrison are driving along a shoreline just as a tsunami appears carrying a ship with it and in seconds Momoa is left swimming against the full hurricane of its onslaught trying to rescue his father are dazzling. The arrival at Atlantis and the 3D pan through the world lit up in incredible colour are visually stunning, while the flashback to see the city as it sinks into the ocean rivals Michael Bay. Or the visually stunning sequence with Jason Momoa and Patrick Wilson fighting in an arena over a pit of lava. There is a jaw-dropping sequence where Jason Momoa and Amber Heard, both fighting in different areas, manage to destroy much of a Sicilian town, which includes exhilarating scenes with Heard pursued through homes and across rooftops with the camera following them in surely the superheroic equivalent of the sequence from one of the Bourne sequels. The scene where the two are on a small fishing boat and are attacked on all sides by creatures from the trench before Momoa dives overboard and leads the way downwards lit up by a red flare as all around them the trench creatures crowd in is a dazzling cinematic image no matter what way you look at it. However, Wan blows everything he does away with the massive battle climax of the film, which seems to combine something of a Godzilla film, the Star Wars (1977) Death Star sequence and the Battle of Helm’s Deep from The Lord of the Rings: The Two Towers (2002) into a single sequence of giant monsters and battling armies that visually leaves you flabbergasted. The plot when boiled down to it is nothing exceptional. It does have the distinction of being co-written by Geoff Johns who has worked at DC Comics on various Superman, The Flash, Aquaman and Green Lantern titles – he wrote the original Flashpoint (2011) storyline that started off DC’s The New 52 reboot – for which see Justice League: The Flashpoint Paradox (2013). If anything, the script tends to resemble something of the plot of The Lion King (1994) – young exiled prince heir has to return to the kingdom to claim back the throne from his relative usurper. There is also a surprising degree of similarity to Black Panther (2018), albeit almost where T’Challa is the villain and Killmonger becomes the hero of the story. That said, the plot of the rightful heir to the throne winning his way back is one that features in many classic stories and goes back to at least The Odyssey. The script here gets the two brothers battling fairly early on in the show and pads time with a Plot Coupons fantasy where Aquaman must travel to various parts of the world to find the trident that will allow him to claim the throne. It is worth comparing Aquaman to Wonder Woman, the previous released film in the DCEU. Wonder Woman did pretty well but I think James Wan eclipses Patty Jenkins when it comes to the superheroic action sequences. On the other hand, while Jason Momoa is a solid presence on screen and with an undeniable likeability, Gal Gadot seemed to embody a purity of moral purpose and drive that Aquaman only occasionally has. Wan tries to outfit Momoa with an occasionally sense of humour – weird jokes about Pinocchio (1940) or with he and Amber Heard eating flowers – but these mostly fall flat. There’s nothing here of the sparring wit that was added in the scenes shot by Joss Whedon for Justice League. Aquaman emerges as a heroic presence on screen because that’s the way the film around him is crafted but Momoa himself emerges less as an heroic force than as a likeable average guy you might sink a few beers with at the local.